The early 1800s marked a time of significant change throughout France. The post French Revolution era came on the heels of the Industrial Revolution. At this time, political institutions and society at large were learning how to operate in a new age of evolved capabilities and lofty dreams, as well as an increased number of working poor and social upheaval. Art seemed to be the only answer to the twisted combination of confusion and excitement that plagued the century. An artist who attempted to bring humor to the uncertainty was Honoré Daumier. Daumier was a versatile artist; he published political caricatures, made his living selling lithographs, and received praise for his impressionist paintings and life-like sculptures. Still, Daumier only experienced a small taste of success in his life. His talent was overshadowed by a greater need to earn money and stay true to his political convictions. 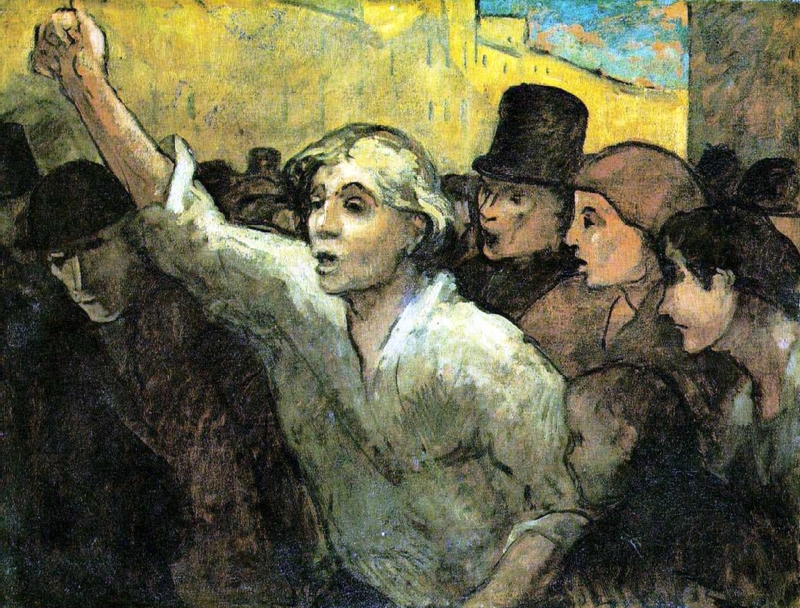 In 1808, Honoré Daumier was born in Marseille, France. After attempting to make his living as a poet, Honoré Daumier’s father, who moved his family to Paris in pursuit of fame and fortune, was financially broke. As a result, around 12 or 13 years of age, the soon to be artist dropped out of school and took employment at a bailiff’s office. He continued in the ways of proper employment as a bookseller’s clerk in the busy Palais-Royal area of Paris where he observed the differences of the people passing by the gardens. Inspired by their uniqueness, Daumier wanted to depict them with his art. Daumier, at an age younger than 20, began learning about lithography. This became a useful skill that would provide him with income throughout his life. 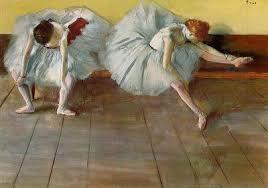 Yet, his artistic passion yearned to be able to express the people and social situations he took in each day. While he wanted to be artistic in ways of painting and sculpture, much of his time was dedicated to print-making. Finally, in 1830, Daumier got some notoriety, as he began leveraging his marketable skills to produce caricatures for satirical publications. At this time, print publications attracted the attention of every person, from the king to a pauper. In 1832, King Louis-Philippe was disheartened by the anti-government cartoon, Gargantua, created by Daumier. The artist was sentenced to prison, and then a mental institution. This was the worst retribution the king demanded for an offending artist. His imprisonment for this caricature marked the end of his punishments, but it did not stop him from publishing pieces of political satire. In fact, between the years 1830 and 1847 he specialized in producing lithography, cartoons, and sculptures. While he continued to work in these areas as a way of self-expression and to secure income, in 1848 there was a distinct shift in Daumier’s career. 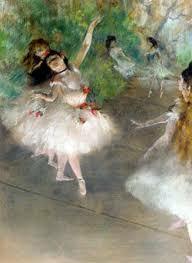 From 1848 to 1871 he thrived in an art form and style he was passionate about: impressionist painting. One reason for this change may have been the death of his 2 year old son. He and his beloved wife, Léopoldine or “Didine” suffered this loss around the time Daumier altered his artistic focus. Honoré Daumier developed a number of talents within the sphere of art throughout his life. The context of his paintings also broadened. As he began pursuing naturalism, he depicted historical themes that highlighted the greatness of nature above men. In addition, he also used literary themes, and remained true to the subjects whom inspired him most—everyday Parisians. He felt as if true life provoked conversation about social topics of the day. Although Daumier never made a commercial success of his art during his lifetime, he was appreciated by many. 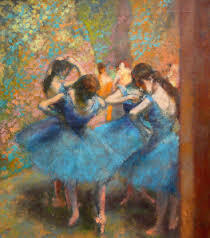 Those include: Eugene Delacroix, Edgar Degas and Jean-Baptiste-Camille Corot. In face Corot when Daumier was destitute and without shelter, bought him a cottage. Towards the end of his life, Daumier dedicated much of his time to sculptures and paintings. His work was considered “ahead of its time” by modern critics who did not come to fully appreciate his work until after his death. In 1879, Honoré Daumier passed away. He was near blind and in debt at the time. It is rumored he was buried in a pauper’s grave. If his life’s work in caricatures indicates anything, it is that he wouldn’t have cared; he lived life depicting the poor, living among them, and dying their death as well. As a result, his art lives on today. Can you relate to being an artist that is currently having small successes in life? This entry was posted in Art Lives, Caricatures, Corot, Degas, delacroix, France, French Revolution, Honoré Daumier, impressionist paintings, Income, Industrial Revolution, life-like sculptures, lithography, poor, poor man, print-making and tagged Art, artists, caricatures, Honoré Daumier, lithography, Segmation on May 29, 2013 by segmation. This entry was posted in "out of the box" art, Art, Camille Corot, Degas, father of impressionism, Gauguin, Georges Seurat, Gustave Courbet, Impressionism, landscape art, landscapes, Neo-Impressionist, Peasant Girl, peasants, Pissarro and tagged Art, Casual Game, Cezanne, Courbet, Degas, Gauguin, Impressionism, landscapes, paint by numbers, peasant, Segmation, Seurat, Signac on May 9, 2013 by segmation. Paul Cézanne was a French artist whose combined use of color, abstraction and geometric precision provided a link between nineteenth century Impressionism and twentieth century Cubism. Born in Provence in 1839, the son of a wealthy banker, Cézanne studied law in Aix before moving to Paris in 1861 with his childhood friend, Emile Zola. While Zola was to become one of France’s most renowned writers, Cézanne was to become one of the country’s most feted painters. 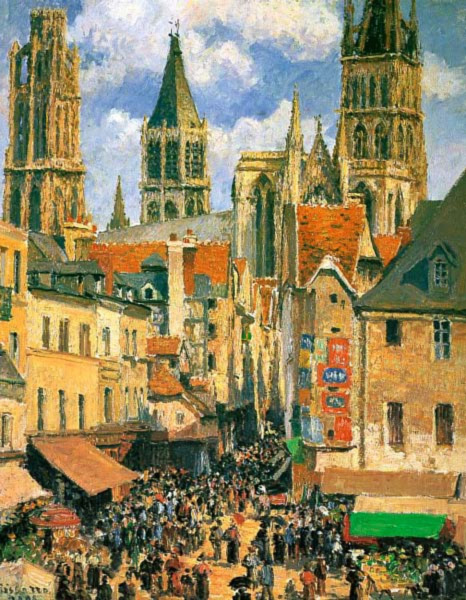 Paris in the nineteenth century was a center for artistic innovation, and it was there that Cézanne met the Impressionist Camille Pissarro, an artist who would guide Cézanne away from his initial dark palette and towards colors that reflected a brighter, more natural light. Although Cézanne knew and mixed with the Impressionists in Paris, including Manet and Degas, he was not particularly sociable. His shyness, short temper and bouts of depression made it difficult for him to form friendships and influenced his early works. His Dark Period (1861-1870), which dates from this time, is characterized by a focus on figures and above all by a use of somber colors, especially black. 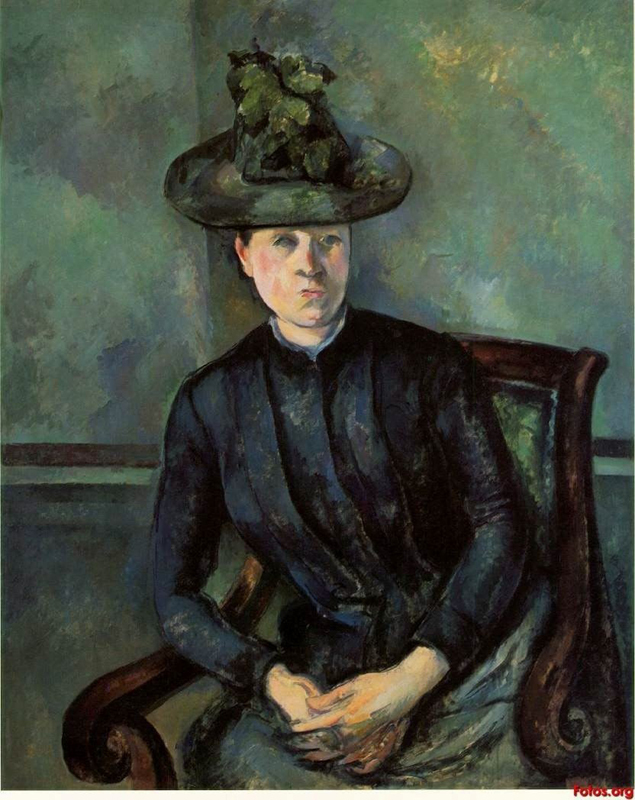 Following the outbreak of the Franco-Prussian war in 1870, Cézanne left the French capital with his mistress, Marie-Hortense Fiquet, moving eventually to Pontoise. Painting alongside Pissarro, Cézanne began creating more landscapes and switched to brighter colors to created works that would lead critics to refer this stage of his life as The Impressionist Period (1870-1878). Indeed, Cézanne’s works were shown in both the first and third Impressionist exhibitions, which took place in Paris in 1874 and 1877. In neither of those exhibitions did Cézanne receive warm reviews from the critics. By the early 1880s Cézanne’s life had become more stable. 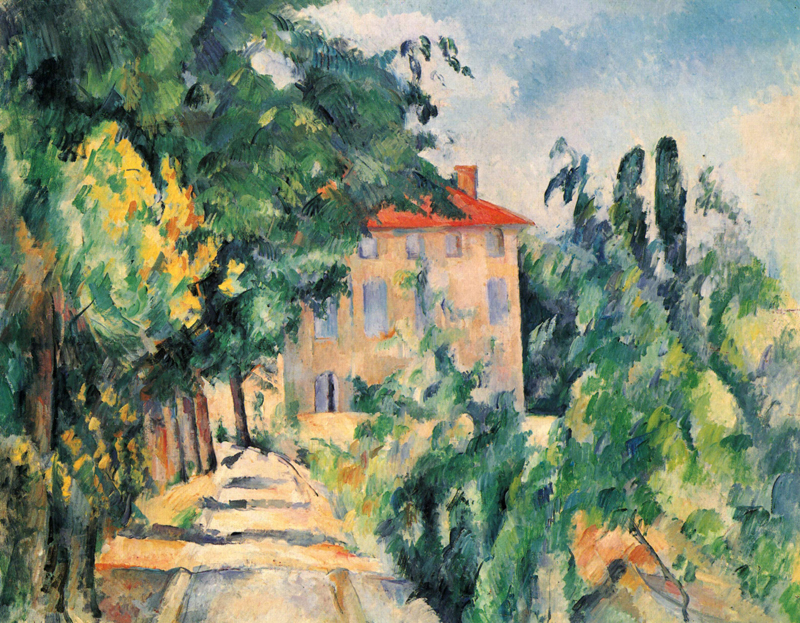 The family, which now included a son also called Paul, moved back to Provence and in 1886, Cézanne married Hortense and inherited his father’s estate. Impressed by Mount St. Victoire near the house of Hortense’s brother, Cézanne was able to combine his Impressionist techniques with a subject containing the solidity and permanence which he felt Impressionist art lacked, and which would later be felt in Cubism. The Final Period (1890-1905) of Cézanne’s life was not a happy one. He had broken off relations with his lifelong friend, Zola, after the writer had based a character on Cézanne’s life, and diabetes affected his personality to the extent that his marriage became strained. Just as acclaim for his work grew, Cézanne himself became increasingly reclusive, repainting the subjects of his old works in different ways. His masterpiece, The Great Bathers, for example, with its geometric lines and focused composition clearly shows his progression from a painting of the same subject made more than thirty years before which focused solely on the figures themselves. You can find a great collection Paul Cézanne patterns to use with SegPlay® PC here: http://www.segmation.com/products_pc_patternsets.asp#CEZ . This entry was posted in Camille Pissarro, Color, cubism, Degas, figure paintings, France, geometric lines, Manet, natural light, Paris, Paul Cezanne, pneumonia, Post Impressionist, Still life painting, The Great Bathers, Uncategorized and tagged Camille Pissarro, Crichon et Compotier, Cubism, french artist, paint by numbers, Paul Cezanne, Post-impressionist, Segmation, still life, The Bather, The Bather and Rideau, The Murder on March 25, 2013 by segmation.